Unless you are a seasoned interior designer baby bedding sets are the easiest and probably the most time cost effective way to decorate your infant's sleeping area. There are infant crib bedding sets for most all of the modern bedroom themes. The best way to get cheap crib bedding sets is to shop the closeout and discount sales. It's likely that you can pick up the entire matching collection for a discounted price that is much less than what you would otherwise pay for just the comforter. The purpose of complete sets is to have a seamless fit of your baby bedding sets and your baby's nursery theme. 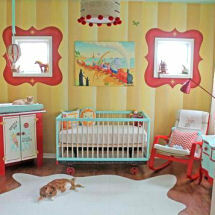 Check the pictures of perfectly designed nurseries featured on some of the online baby websites. You will find one dreamy image after another of some of the most trendy baby bedding collections in hundreds of themes or designs! There are western bedding sets, Chinese baby bedding sets and so many other obscure sets of nursery bedding that it will make your head spin. But, this is still without a doubt the easiest way to lay out a basic blueprint for your baby's nursery design and decorations. Busy moms don't have time to look past the first page or so of crib bedding pictures at the baby bedding discount stores online. So, here's some stuff that the overworked mom with decorating in mind might like! The New Care Bears crib bedding sets come in many new fabric prints. If you are decorating a baby girl's room, there are pink prints as well as sets with comforters in shades of blue for a baby boy's nursery. For the decorator that prefers a gender neutral baby bedding sets, Care Bear fabric in green and yellow will provide the groundwork for an excellent unisex color scheme. Baby Looney Toons fabric is full of bold, primary colors taken right out of your favortite cartoons and comic books. Tweety Bird and Sylvester the Putty Tat will give your nursery an animated, colorful look without any trouble! While looking for baby items for a Circus Nursery Theme, I hit the jackpot for baby bedding sets and accessories for a John Deere Tractor or farm nursery theme! A while ago I was putting a John Deere theme together for a lady and I couldn't find any John Deere decorative items OR baby bedding sets! And so will the John Deere bath set, wastebasket, and the Contemporary John Deere Rug! I really hit the farm tractor decorative accessory jackpot! Let me begin by saying that I don't live or work in a rural farming environment. This makes the fact that I've had more than a few requests for John Deere decorative items and baby bedding sets a little strange! It was a little odd, but I got into the spirit of things. I like to do things and work with baby bedding sets that are a little different. I set out to find some John Deere Fabric to make a valance that would look good with the baby bedding set and baby gear that she already had. Then I found this really cute John Deere Halloween Village to display on a table well out of baby's reach! It all turned out pretty well considering my lack of farming and bright green decorating skills! With all the interest in the rainforest and the jungle animal prints are hot in baby bedding sets as well as old kids linens. Zebra print seems to be one of the most popular. Striped nursery bedding, zebra wallpaper and zebra lamp shades are all over the place! Animal print baby bedding sets really turn out a nicely decorated room. I wonder why nobody's manufactured a baby stroller with a cheetah or leopard print? Black and white zebra baby bedding sets accessorized with hot pink accents is trendy and at the top of the list when putting together a trendy modern room! If you're not into warm color schemes blue zebra baby bedding sets bedding may be your taste. Zebra print may not yet be in your book of nursery design ideas, but it should be! Did you ever think that you'd be considering hot pink fur as a workable fabric for a baby bedding set? Zebra print looks fabulous with hot pink and other funky cool colors! Throw a zebra print rug on the floor, get some shaggy faux fur rugs and pillows and you've got a modern nursery that your pre-teen will envy! Who doesn't love and want to know where to get cute baby gear and toys? Baby stuff is especially irresistible when it includes pictures of little yellow ducks! The duckie crib bedding in this post has a nice vintage feel and could be used in a Jemima Puddleduck style room or in any room where yellow toile fabrics are needed. It's just a good toile fabric in a children's print. Before bedtime there's bathtime, of course. Little yellow rubber duckies are a baby bath gear classic motif. Ducks were popular in the baby's bathtub long before the Sesame Street characters were singing songs about them. I'll always remember laughing at Baby Sesame Street's Ernie singing to his duck in the bathtub. If you want to bring sunshine into your home and a smile to your baby's face pick up baby bedding sets covered in cute old-timey ducks or geese! There's a just ducky 40's nursery print crib bedding set and ideas for a rubber duck themed baby shower on this website. For unique and interesting crib sets and ideas for how to use them refer to our decorating projects and crafts articles at Unique Baby Gear Ideas.